Go ahead. 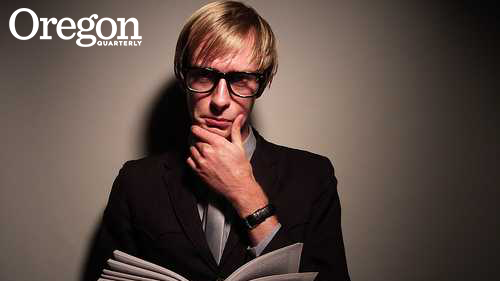 Ask Colin Koopman about the job prospects for philosophy majors. As his undergraduate students quickly find out, it's a question he loves to answer. In addition to boasting the highest average scores on the Graduate Record Examinations (GREs), college philosophy majors consistently rank near the top of the pack in midcareer salary, ahead of disciplines such as accounting, chemistry, and marketing. While the classified ads may not be overflowing with job listings for philosophers, Koopman says philosophy students learn how to analyze, synthesize, and make sense of complex issues—giving them a leg up in the job market. "Philosophy majors tend to be the people who rise quickly through the ranks, and that's not because organizations need to know the truth as Plato laid it down," he says. "It's because these students have valuable skills that they develop by dealing with philosophical debates and disagreement." Philosophy with Koopman features a blend of big ideas and big experiences. In his 2012 freshman seminar, Justice Matters, Koopman organized a trip to Salem for students to attend a hearing at the Oregon Supreme Court. During the recess, two members of the high bench—Chief Justice Thomas Balmer and Justice Rives Kistler—spent more than 30 minutes fielding questions from students about politics, morality, and the law. "The highest judges in the state of Oregon basically skipped their lunch to hang out with 20 first-term freshmen," Koopman says. "The students really got a lot from being able to have a serious conversation with these people and be taken seriously by them." For eventual philosophy majors, the freshman seminar can serve as a springboard into Koopman's introductory Internet, Society, and Philosophy course, where the fourth-year professor draws students into timely debate around the issues of privacy, identity, and intellectual property on the Internet. These themes frequently overlap with salient experiences in the lives of freshmen and sophomores who have grown up wired to the Web. They arrive in class having already developed online personas through their Facebook profiles and Pinterest pages, often without giving much critical thought to the version of themselves they're presenting online. In this networked environment, students grappling with the age-old struggles of self-discovery are confronted with a new digital wrinkle: the world (wide web) is watching. Koopman knows this experience can be daunting—but it can also serve as fertile ground for developing personal insight and an understanding of philosophy in action. "The goal for me is not to give anybody the 'right answer,'" he says. "I want to give students tools for thinking about the things they're already thinking about." Off-Campus: Koopman enjoys camping, hiking, and canoeing with his wife, and has a taste for 19th-century American literature. His current reading list features works by Nathaniel Hawthorne, William Dean Howells, and Edith Wharton. Last Word: "We're not educating students. We're helping students educate themselves."